The Samford Black Alumni Association (SBAA) hosted its annual African American Alumni and Friends Luncheon April 25 at The Club. The luncheon’s emcees, 2004 alumnus and SBAA board member Kendell M. Jno-Finn, and senior journalism and mass communication major Yvonne Gross, encouraged the more than 200 people in attendance to reflect on their own Samford experiences and to support the SBAA Program Fund, and Minority Student Annual and Endowed Scholarship. Attendees responded with great generosity, raising more than $2,000 for these two Samford funds. 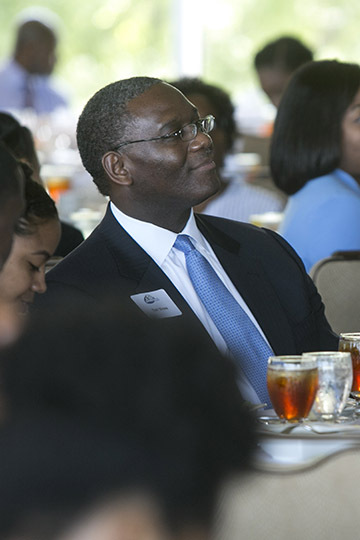 Chair of the Board of Trustees of Samford University Tim Vines was the luncheon’s featured speaker. Vines offered a challenge that he said lies at the heart of Samford University: to serve others, to be on mission for God, and to remember the sacrifices others have made for you and return the favor to someone else. “Recognize that God has given you the opportunity to do something special for him. Grow where God has planted you, and use your talents, abilities and skills to be the best that you can be for the glory of God,” Vines said. The luncheon also provided the Sigma Eta Chapter of Delta Sigma Theta Sorority Inc. the opportunity to announce the 2016 recipient of the Tiffany Nicole Conaway Memorial Scholarship. The $1,000 scholarship is presented annually to a Samford minority student who is in good standing with the university, demonstrates academic excellence and shows active involvement in community service. Senior and chapter president Erica Smith presented the scholarship to junior music education major Juliette Stanley from Leighton, Alabama.